It was right before a severe thunderstorm hit on March 29, it was around 9:00 or so when it stormed. We were all outside watching it come in, me and my neighbor were outside taking pictures. She took this photo of me and her and we never looked back at it because it was a ''goof'' photo. 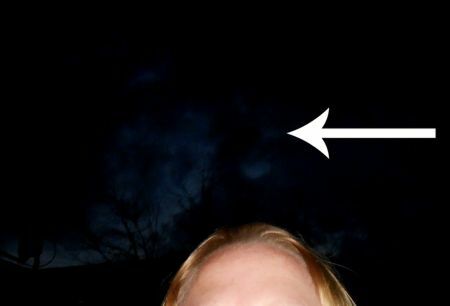 Well the next day being Easter my mom and I were out eating and flipping through the photos on my camera and she had pointed out that there was something above our heads.